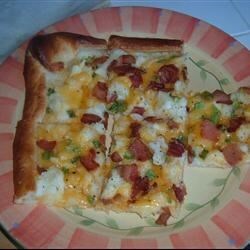 "Mashed potato pizza is a pizza using mashed potatoes instead of sauce. I modeled it after a pizza I had at Willoughby Brewing Company, if you like this one, try the original! You can use any toppings you like on your baked potatoes, this is how I like it. Bon Appetite!" Preheat the oven to 350 degrees F (175 degrees C). Cook bacon in a large deep skillet over medium heat until crisp. Drain, crumble and set aside. Spread the pizza dough out on a lightly greased baking sheet. Spread mashed potatoes over the dough, leaving a small crust around the outside if you want. Sprinkle the cheese and bacon evenly over the potatoes. Bake the pizza in the preheated oven until the cheese is melted and bubbly, about 20 minutes. Let cool for 2 minutes, then slice into wedges and top each one with a small dollop of sour cream. This is a great recipe. I use to get something similar at a nearby pizza place when I was in college. I add green onions to mine for extra zing. I make this but I use Ragu parmesan & mozzerella sauce before putting the potatoes on the crust. It is good, the kids love it. I used to make a similar one for son when he was smaller. I have used sweet potato too and added crumbled sausage to it. Yummy! this was good. definitely not something to die for. maybe a white sauce wouldve added more flavor like some people are saying.